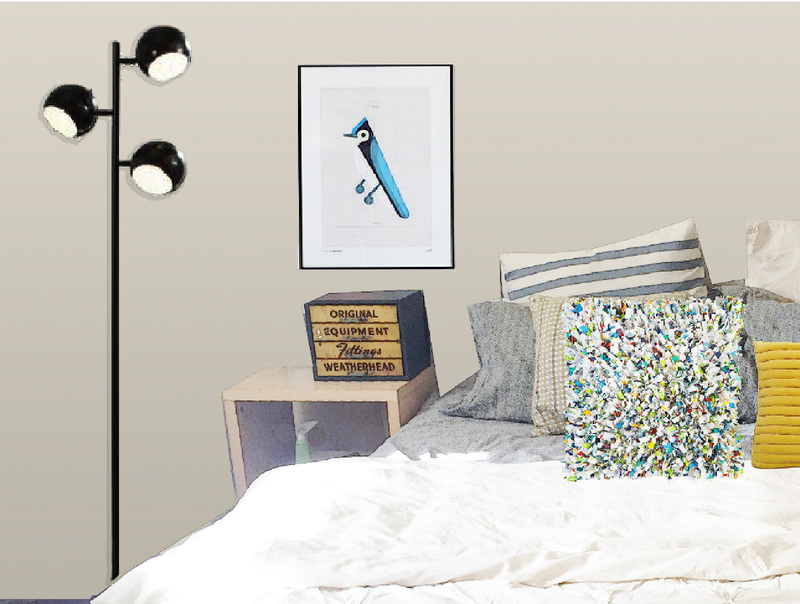 art bedroom cb2 desk lamp diy headboard etsy headboard ideas josh brill tree lamp vintage wall art washi art washi tape weatherhead tool box west elm tufted duvet What exactly is a headboard for and do I really need a bed frame? It's really all up to you. My room sketched below shows only the box springs wrapped in fabric to act as an upholstered frame/base. Instructions on Crafty C0rn3r and many other sites. 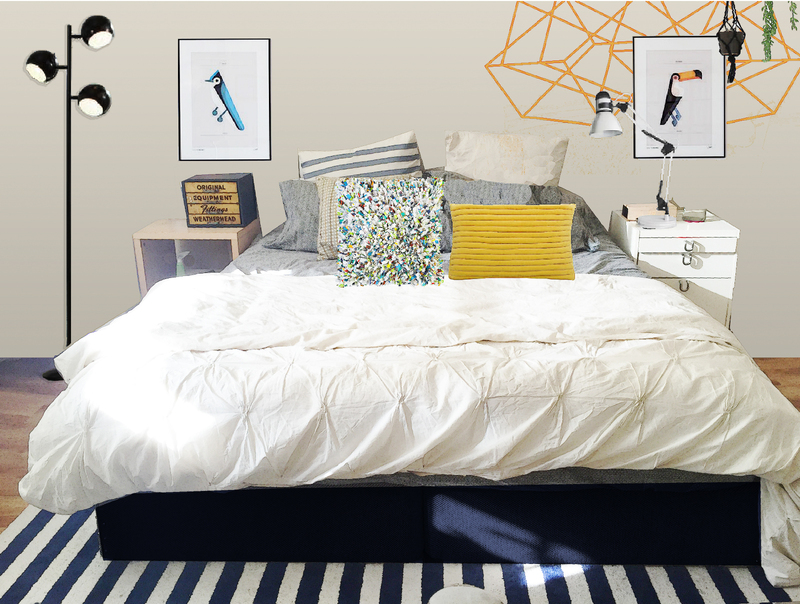 "The pictorial history of the headboard starts with the Egyptian pharaohs. Headboards carved in ebony, silver and gold (clearly more for show than comfort) are depicted in many early drawings. Next were the Greeks and Romans. More practical in their approach, they designed a basic wooden platform with a headboard to protect themselves from cold drafts. The headboard allowed them to eat and even socialize around the bed, making the bedroom the main entertaining area in the home. With the Middle Ages came the canopy and fourposter designs. More intricate and elaborate, the bed became the most expensive and important piece of furniture in both rich and poor homes. The Tudor reproduction headboard and base shown here are simply decorated and perfect examples of the era, yet they fit comfortably in a 21st-century setting. Upholstered headboards (or stuffers, as they were originally known) became popular during the 17th century, as the demand for comfort increased and draping fabric on canopy beds died out. " 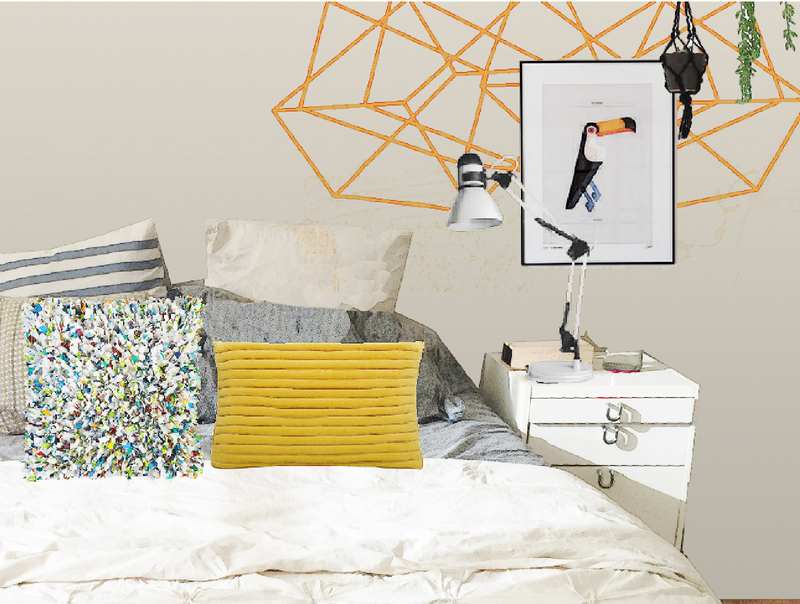 Today, we mainly use headboards as a statement piece, so why not opt for art instead? Thanks to Pinterest and photoshop, I've posted a tangible collage of my dreams. P.S. If anyone knows where I can get a similar upcycled CB2 pillow (in a similar color scheme) no longer for sale I would greatly appreciate the feedback. Tiered Tree lamp by Better Homes, $56. This floor lamp is a steal. I love the simple stems with the adjustable globe light settings.